Today’s Gospel selection from St. Mark recounts the martyrdom of St. John the Baptist at the hands of a weak-willed King Herod…a saga of religious dedication and heroism meeting human nature. John the Baptist was a man who was completely absorbed in the person of Jesus Christ. He had one mission: to point out Jesus to others. 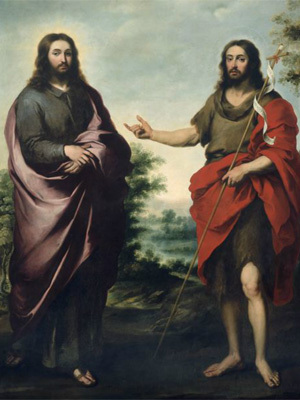 The persons of John the Baptist and Jesus go hand in hand…both giving of themselves without reserve. Sad to say, the heroic life of John the Baptist ended with the almost ludicrous actions of King Herod. Herod was a petty ruler, the pawn of an unscrupulous wife; he allowed himself to become trapped by the party-dancing of his own young daughter. He was so taken up by the party, the people present, and the dancing of his daughter that he promised her anything, even swearing about his intentions! The ultimate outcome: John the Baptist was murdered per the request of Herodias, beheaded at the end of the party. John’s heroic life ended as a victim of humanness, weakness and sinfulness. We hear this story as 21st Century disciples of Jesus Christ. Like John the Baptist, we have been called to point out Jesus in our world, to unselfishly love and serve the Lord day by day — even in the hum-drum times of life. As was mentioned in today’s 1st reading from Hebrews, our love for Jesus is expressed in simple, practical ways like hospitality, concern for the needy, faithfulness to our vocations, detachment from things, and reliance on God. Our lives may not appear heroic or romantic, but we are invited to give ourselves completely to God…in the humanness we experience. As “Ordinary Time” continues to unfold and we embrace these wintry days, what challenges do we face on a regular basis as we point out Jesus in our world? Do we at times “get carried away” by people or situations? What helps us maintain our strength and perspective? Let the words of today’s reading from Hebrews be review of life for us…an opportunity for growth in both love and service. Fr. John Schork, C.P., is a member of the Passionist community in Chicago, Illinois. Error: Error validating access token: Session has expired on Monday, 18-Mar-19 14:16:37 PDT. The current time is Thursday, 18-Apr-19 19:24:04 PDT.